Any occasion is a good one for cake, and Erin's yummy treats will not disappoint! Get ready to start salivating! Hi I'm Erin Wilson from Sunshine and Carousels. If you've ever read my blog before you'll know that I love to make pretty things and I love to bake cake. I'm so happy to be a part of Mollie's Tea Party Week. I'm a sucker for any kind of party or celebration! Oh and anything girly and sweet...I'm so there. :) Today I wanted to share a fun little cupcake recipe that would be perfect for the most darling tea party. My favorite kinds of hot teas are anything citrus like...green tea with lots of lemon, lemon cream or anything orange flavored. Love it all. 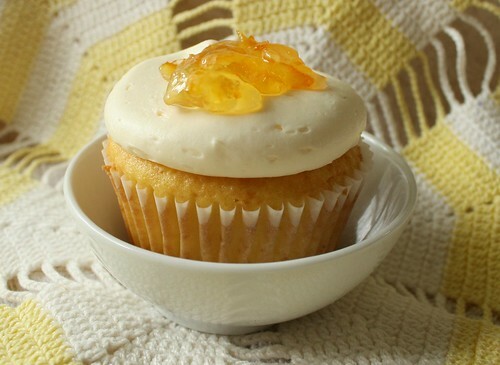 So here's the perfect cupcake recipe to compliment these kinds of hot teas. Preheat oven to your oven to 325 degrees. Sift all your dry ingredients in a large bowl. In a small bowl, whisk eggs, orange zest and lemon zest, juice and oil together. Add egg mixture to the dry ingredients and mix well. Fill your cupcake liners 2/3 of the way full and bake for 20-25 minutes or until golden on top and firm and bouncy to the touch. 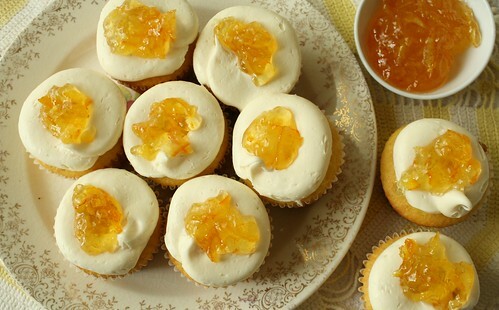 After your cupcakes have cooled ice the outer rim with cream cheese icing (see recipe above) and spoon a teaspoon of marmalade jam to the top of your cupcakes after they have been iced. You are all set now! Let's have some tea. Thank you so much, Erin! 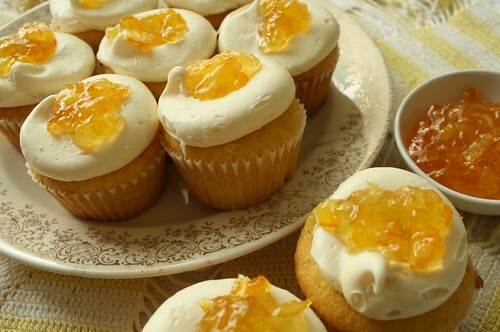 Would you care for some lemon in your tea to go with these cupcakes? Just thought you should know that I have been LOVING all these tea party themed posts! Just posted my tea party post! Hope you like it. Wow! Those look beyond amazing! I found your blog here http://mammamadedesigns.com/2011/05/27/mollie-and-me-making-some-tea/ and I'm loving it so much! I've bookmarked it to come back many times! I got to your blog from Mamma Made Designs, which I saw on Spoonflower! Love the tea party ideas. My two best friends just hosted a tea party for my 30th birthday, I loved it and I'm loving all your blog posts. Erin is the queen of cupcakes!! i've just finished baking these with the slight modification of adding lime zest and juice in place of orange, and using lime marmalade on top. These cupcakes look so yummy. Thank you so much for the recipe.